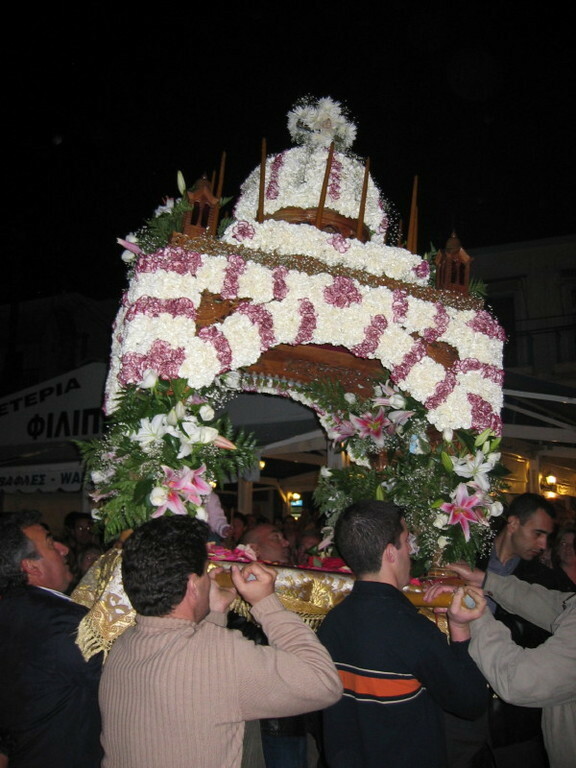 Easter is the most significant religious holiday celebrated throughout Greece. 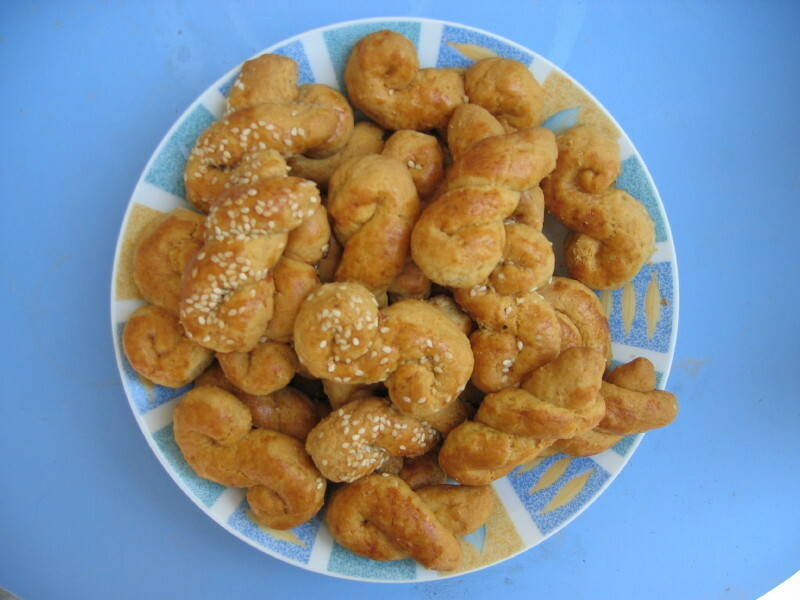 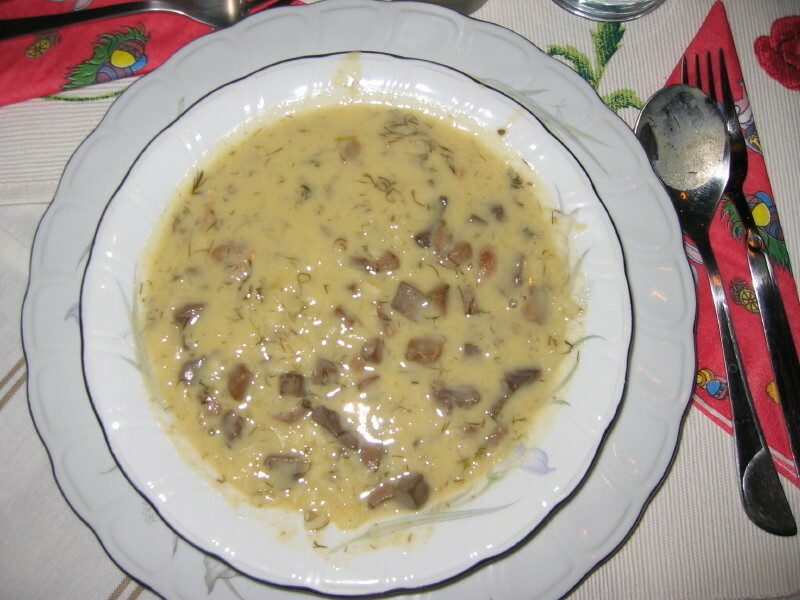 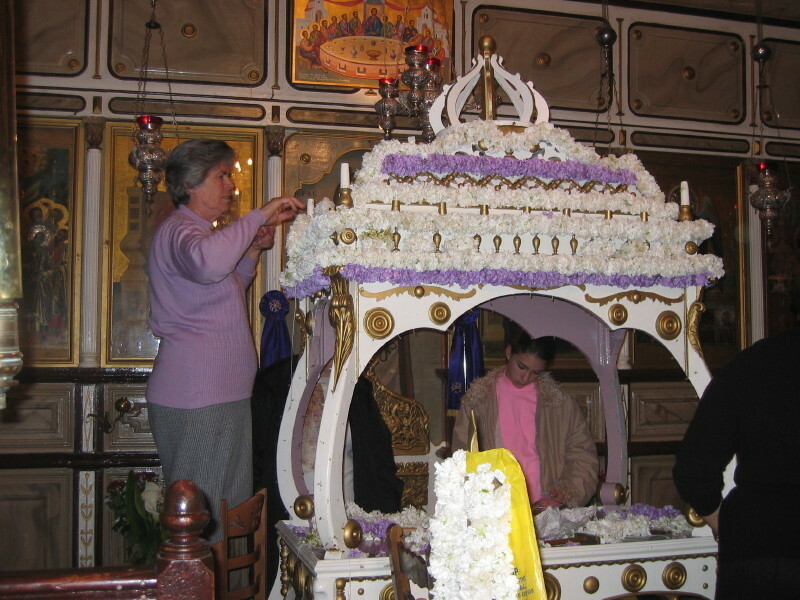 During the 40 day period of Lent preceding 'Megalo' (Big) Sunday, many Orthodox Greeks will fast, becoming even more strict about what they eat in the final week. 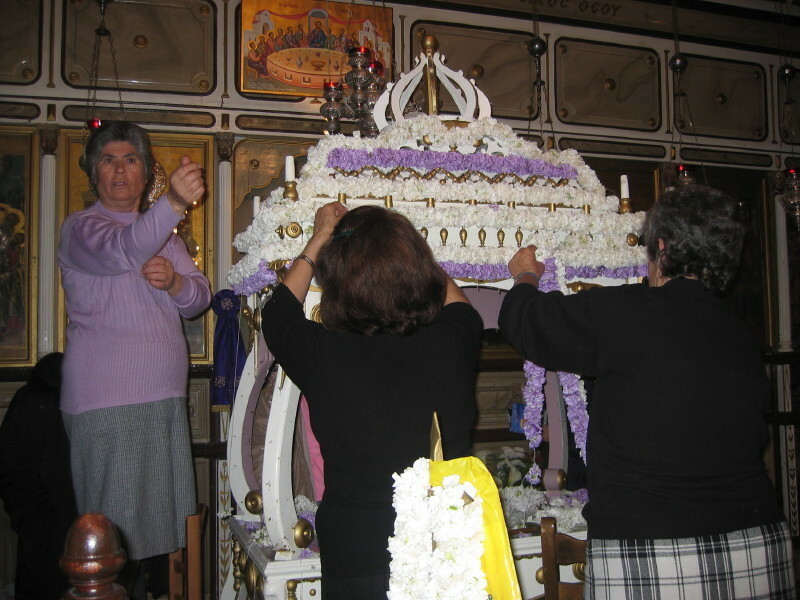 During the final week there will be church services every day and night. 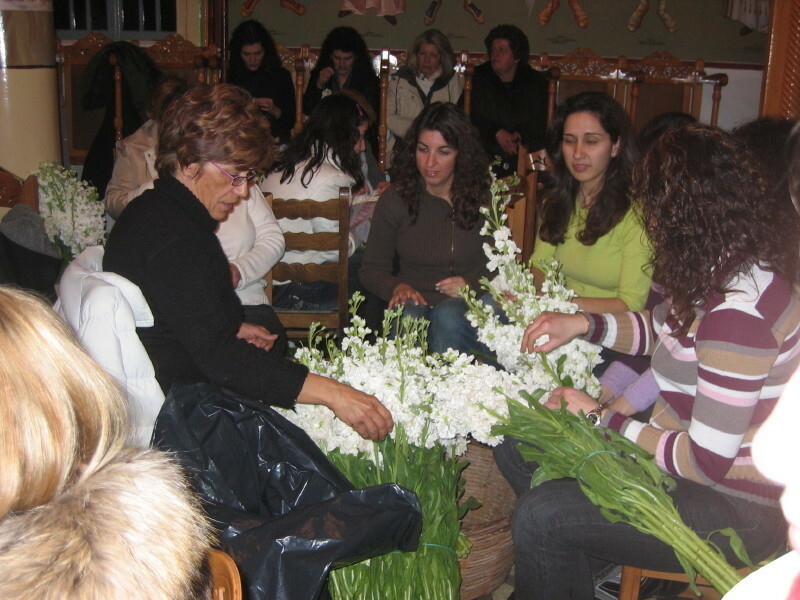 Easter in Greece is given far more importance than Christmas and is celebrated throughout the country with more enthusiasm than you would find elsewhere in Europe. 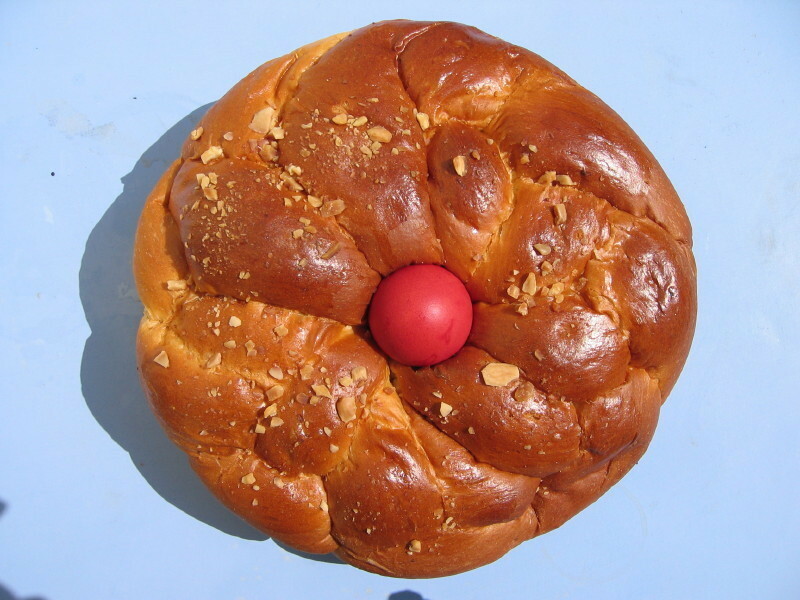 As with Western Easter, the actual date changes from one year to the next, but Orthodox Easter only rarely coincides with the non-orthodox Easter. 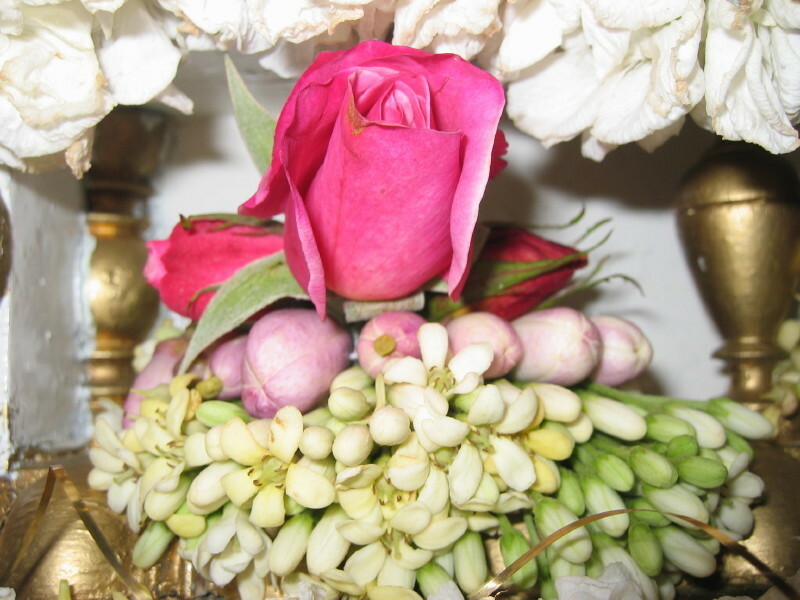 The religious calendars are slightly different even though the celebrations are the same. 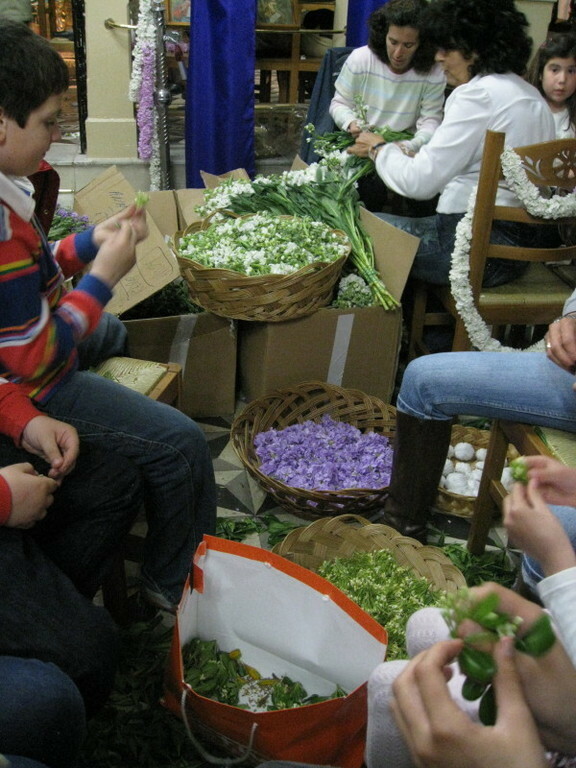 At this time of the year the island erupts, with children and adults letting off very loud fireworks for at least the two weeks leading up to the main weekend. 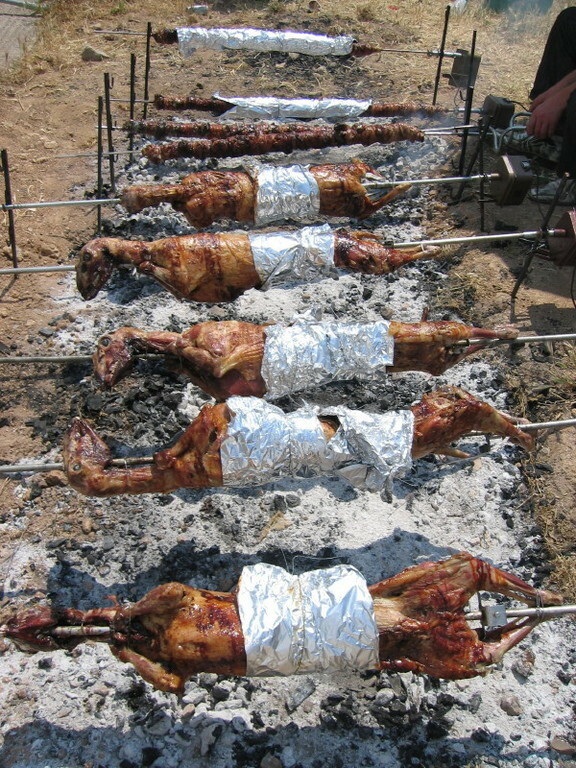 The afternoon stillness is punctuated with shotgun fire and bangs that make the unwary leap out of their skin. 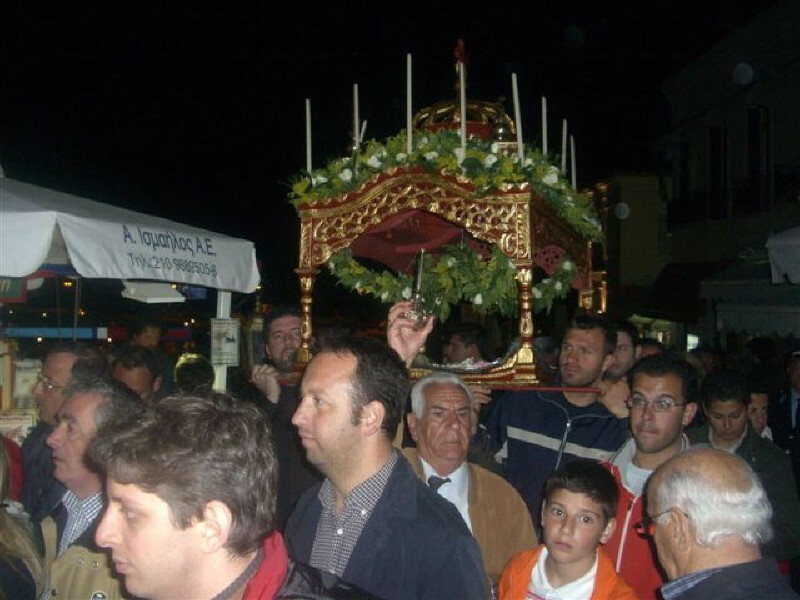 Officially, Easter starts on Friday ('Megali Paraskevi') with quiet church services, followed by sombre processions from the old harbour and the opposite end of the seafront, Kounoupitsa, all coming together on the Dapia. 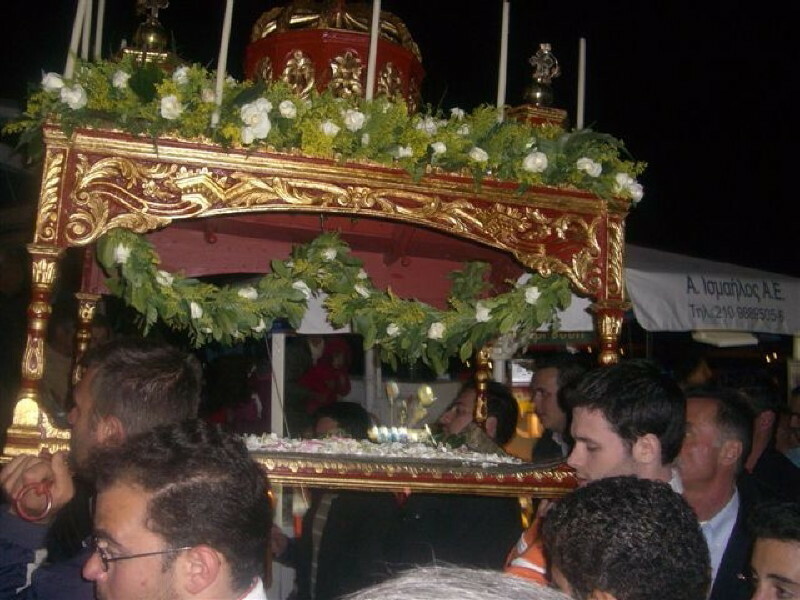 Each procession will hold an 'Epitafios' (an imitation of Christ's funeral bier) aloft at the front, with as many as 6-8 bearers. 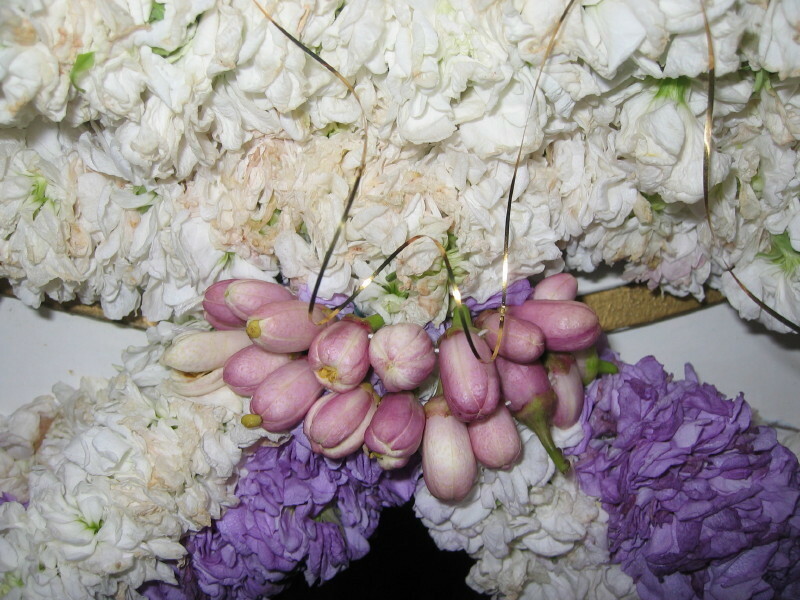 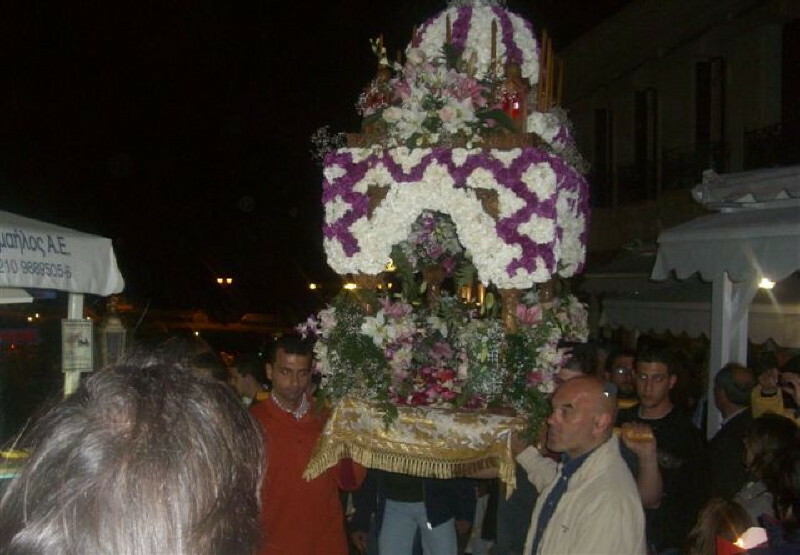 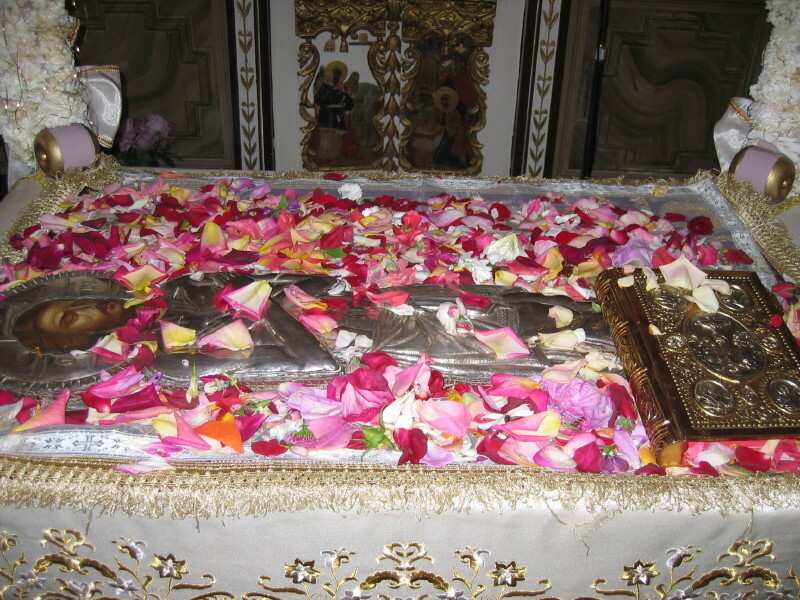 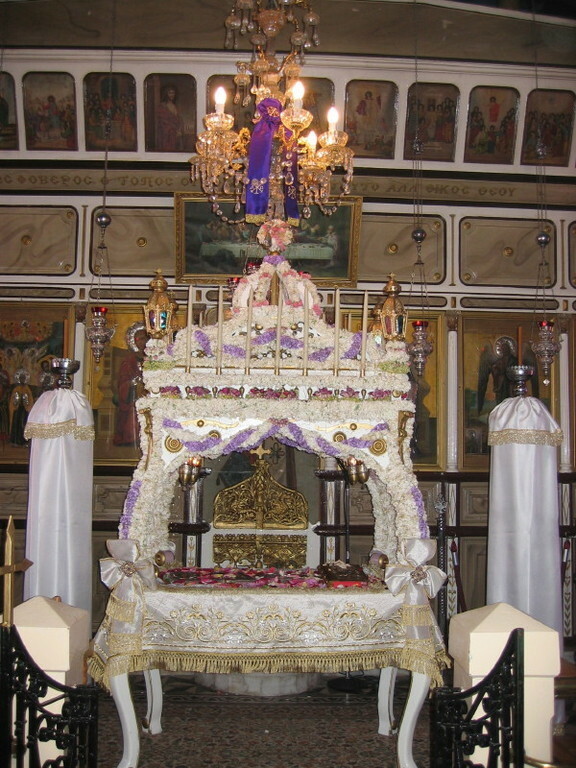 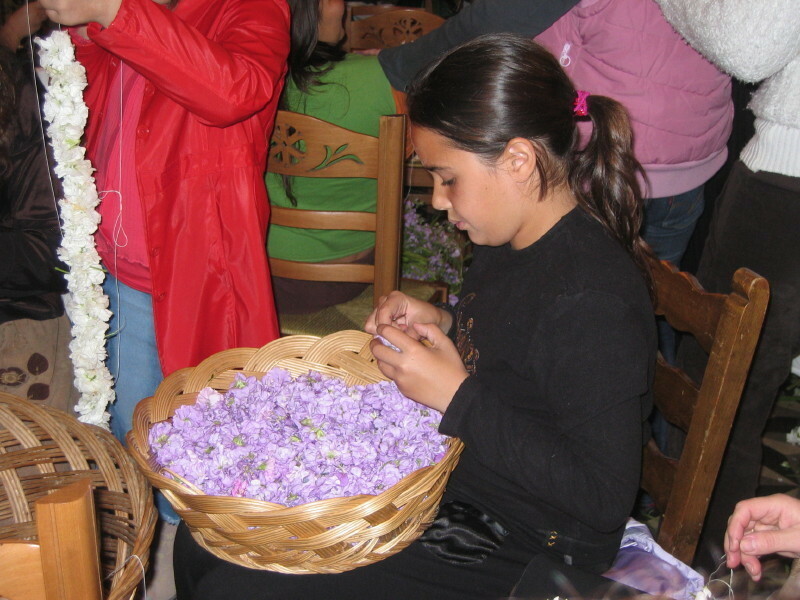 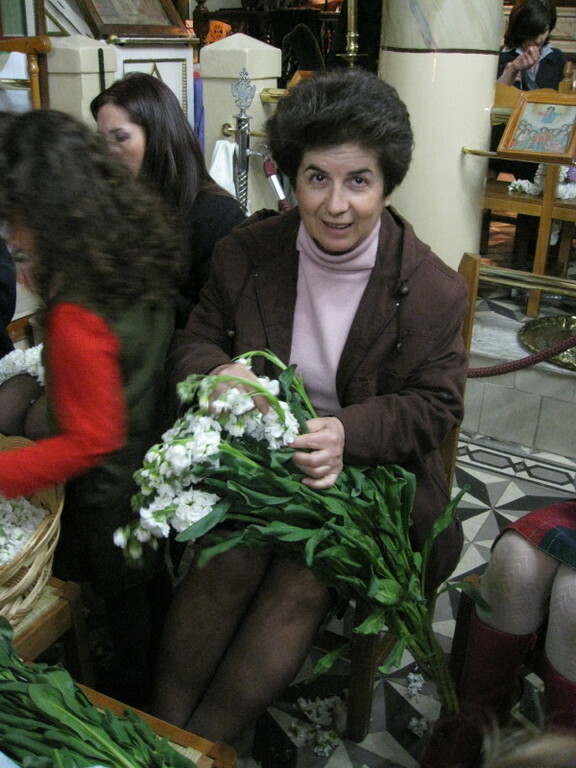 The epitafios' will be decorated all through the Thursday night with an abundance of colourful fresh flowers. 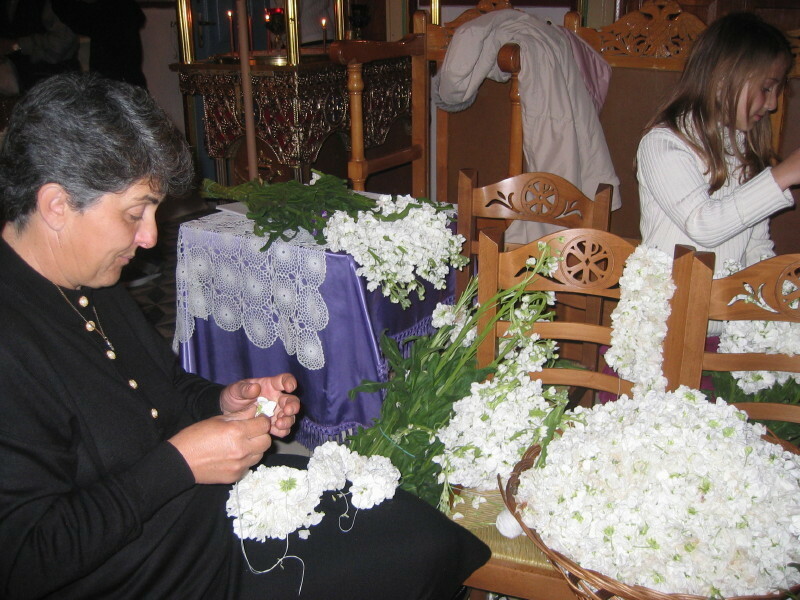 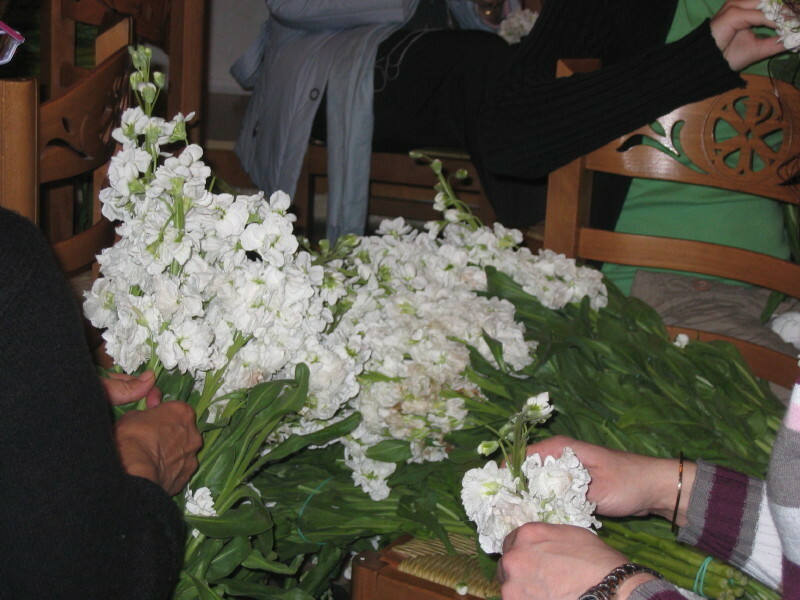 Spetsiots (mainly women and children) valiantly sort, sew and thread flowers in local churches ready for Friday's ceremony. 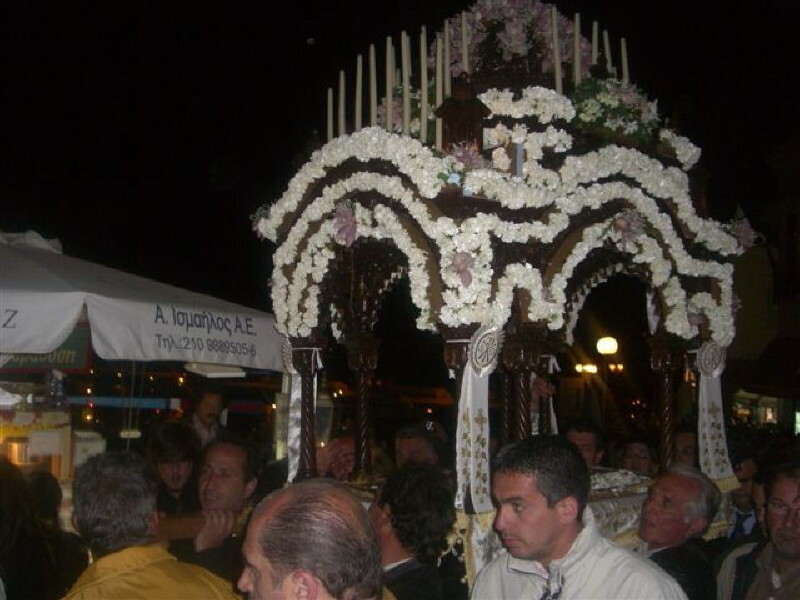 The church procession of Analypsi in Kokinaria will wind its way down to the old harbour seafront and meet and follow on behind the Ayios Nikolaos procession at their church courtyard. 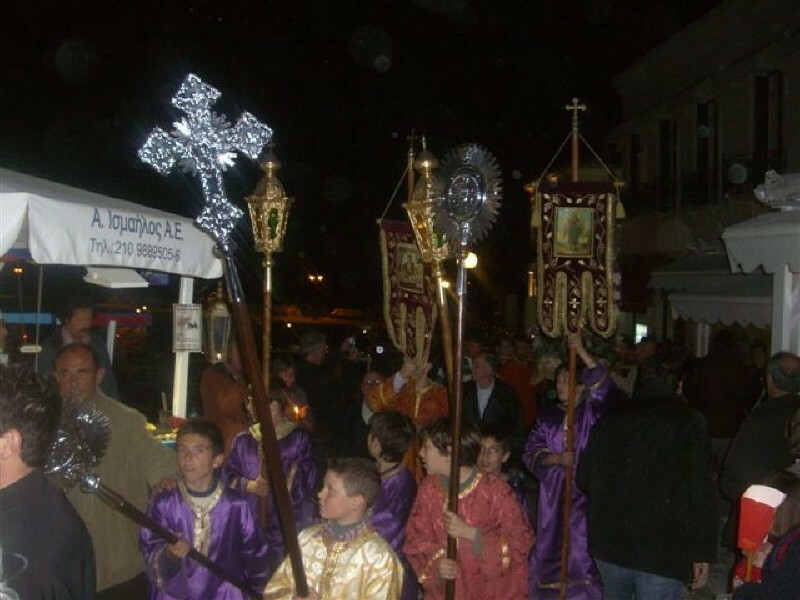 Brown candles are carried by the crowds behind, to signify the death of Christ. 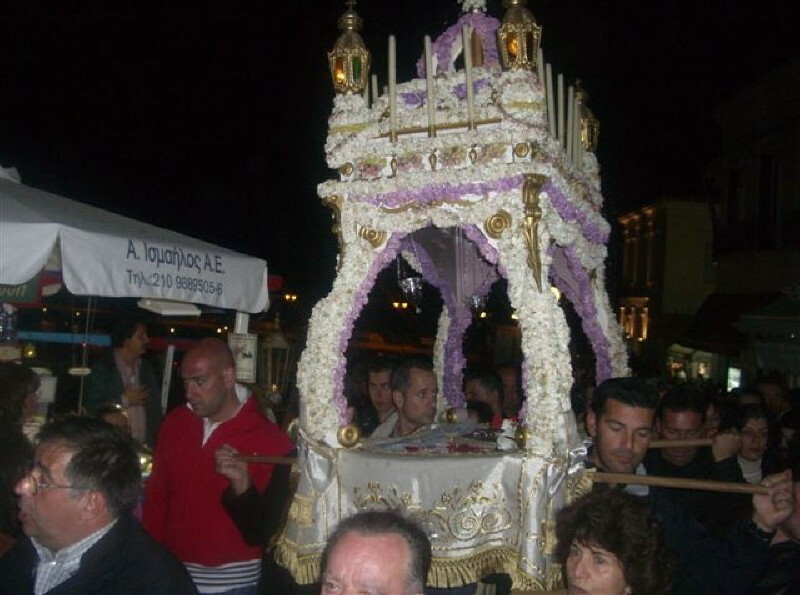 At the same time, processions from Kounoupitsa will slowly walk towards Ayios Georgios on the Dapia and arrive at the same time as the old harbour led procession and this will end with another church service. 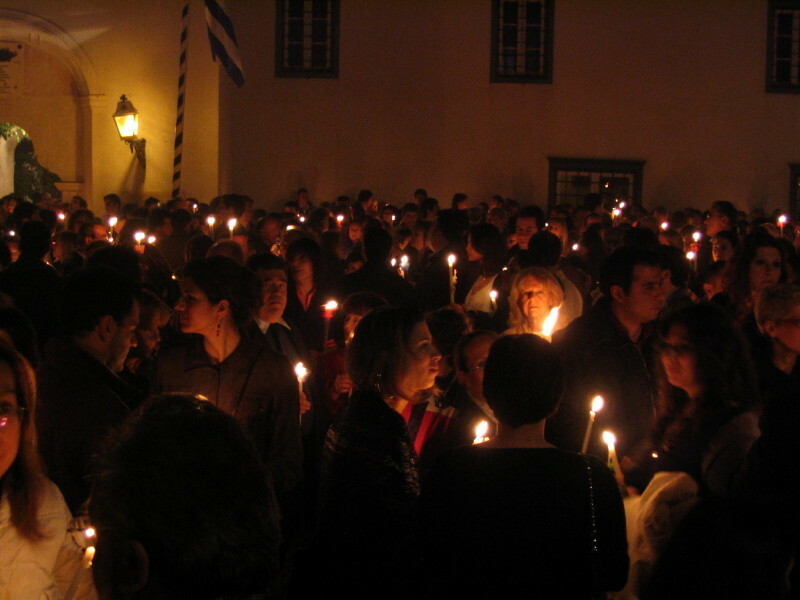 For midnight mass on the Saturday, throngs of people with unlighted, candles gather at Spetses' main churches on the harbour. 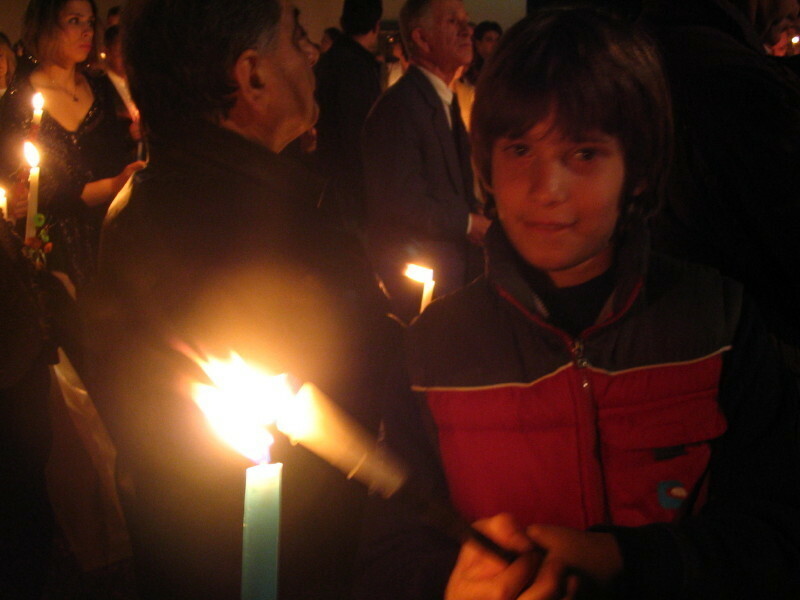 These candles on Saturday are white (or brightly coloured - gifts from Godparents) as they signify that Christ will rise, as midnight strikes. 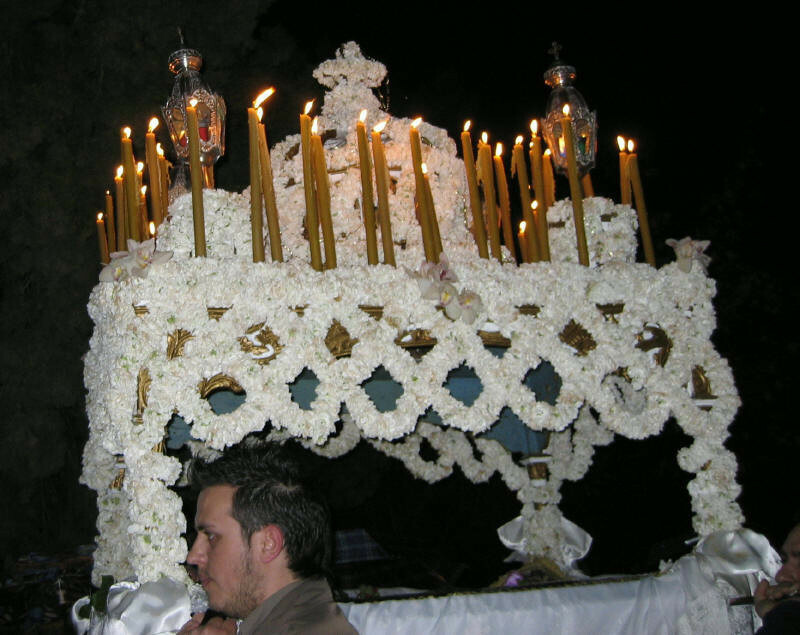 There are so many people gathered at these small churches that they cannot all fit inside and so the congregation overflows outside. 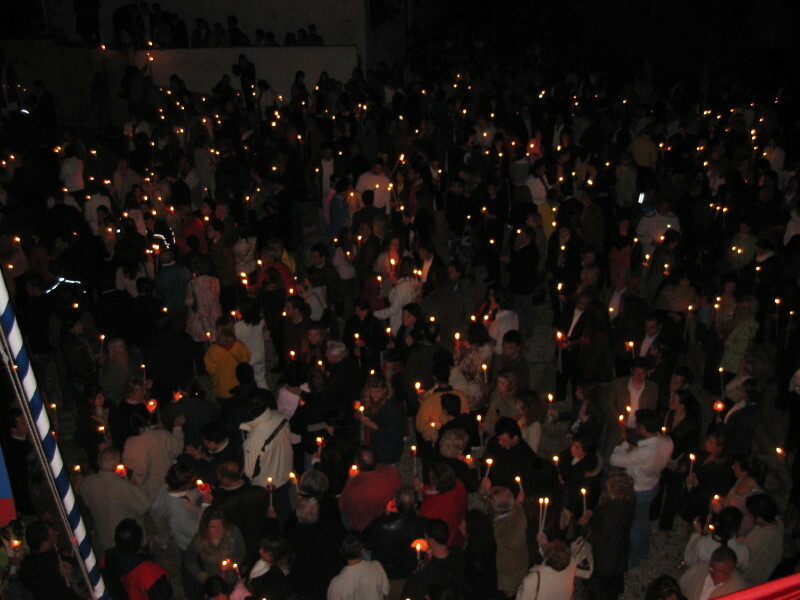 At the end of the service the Bishop lights the candles from the main one in the church, then everyone starts to light each others, until even the people waiting outside have had their candles lit. 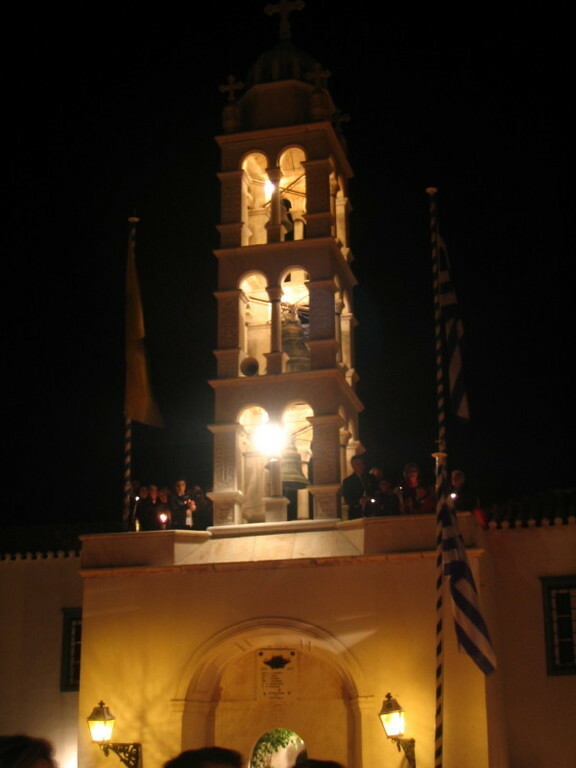 People shout 'CHRISTOS ANESTI' (Christ Has Risen) and kiss each other with joy. 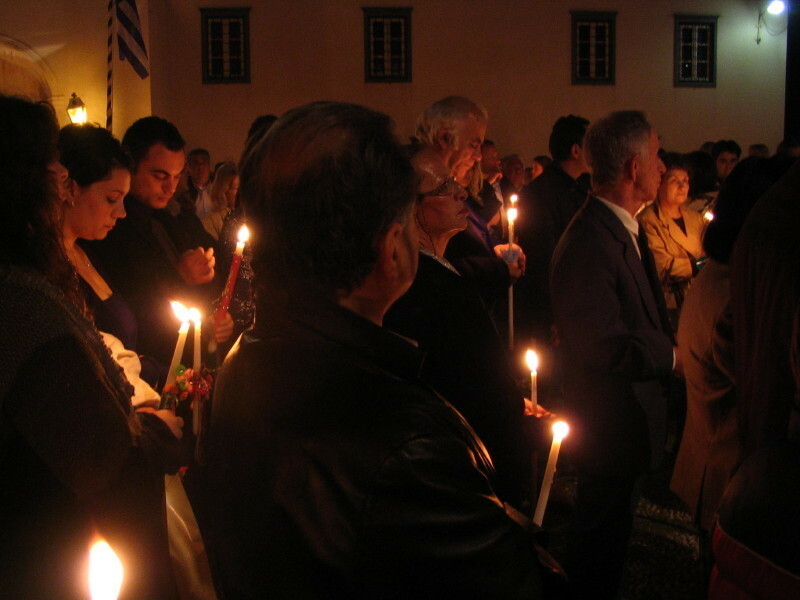 Then slowly everyone takes their candles home, using all sorts of odd methods to keep the light going. 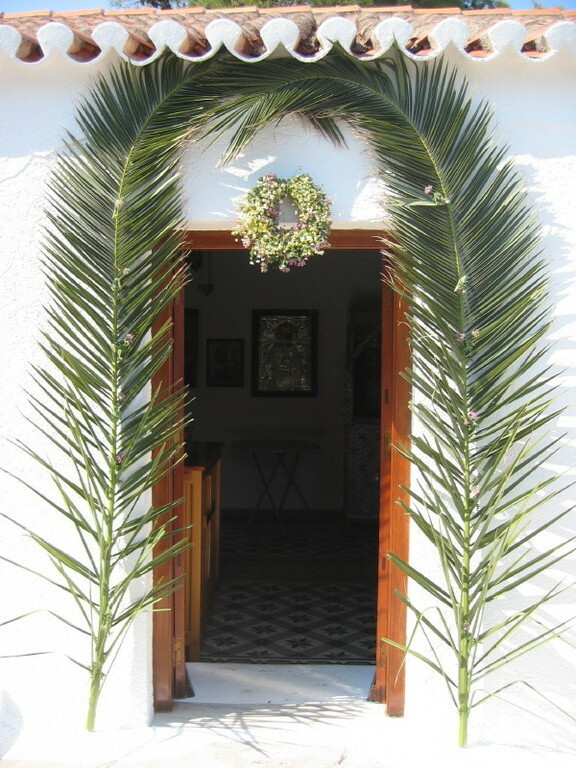 The candle smoke is used to make a cross on the ceiling above the main door of peoples' homes to bless the house and the residents who live there, for the coming year. 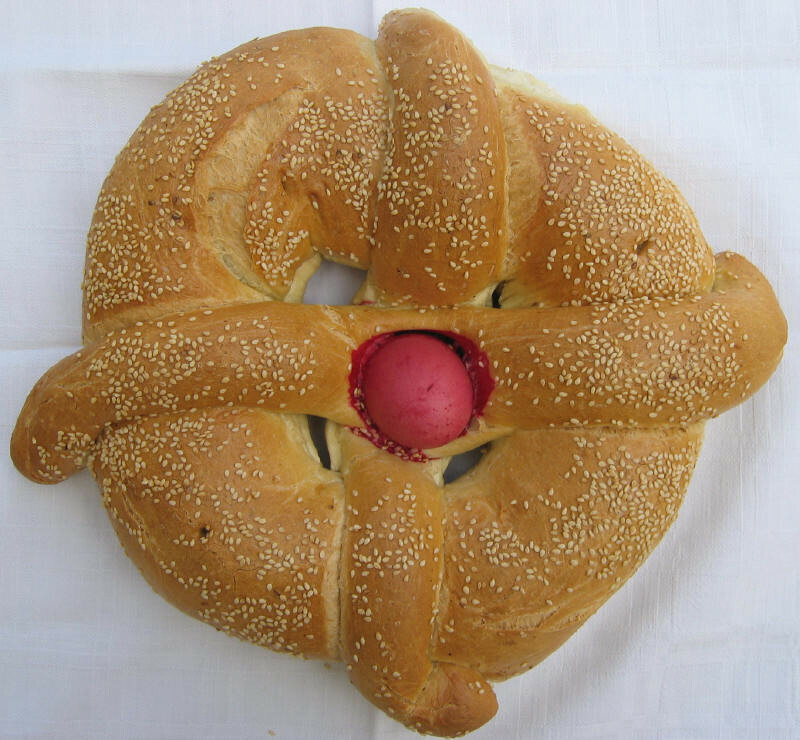 *The Western influence over the last decade has meant that shops now sell chocolate eggs, but they are predominantly dark chocolate. 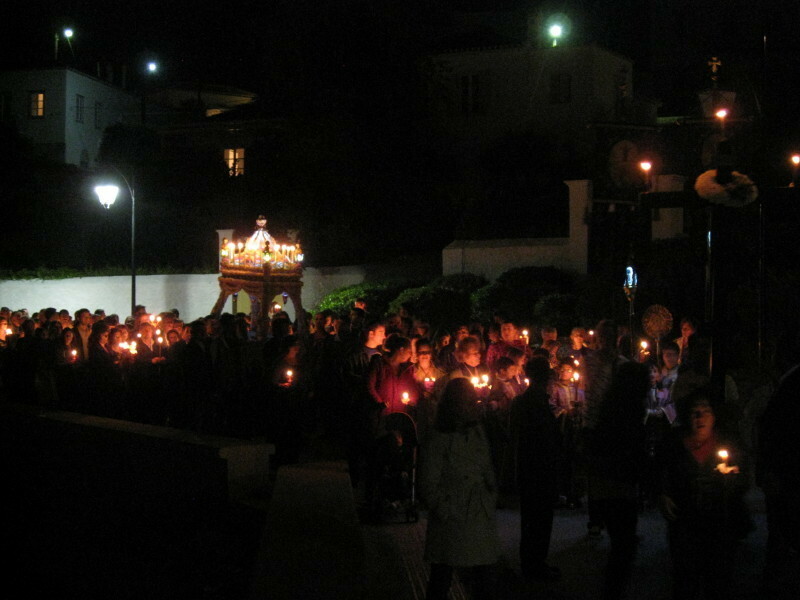 On the Monday evening, just before sunset, in Kounoupitsa, everyone jostles to witness the execution of Judas. 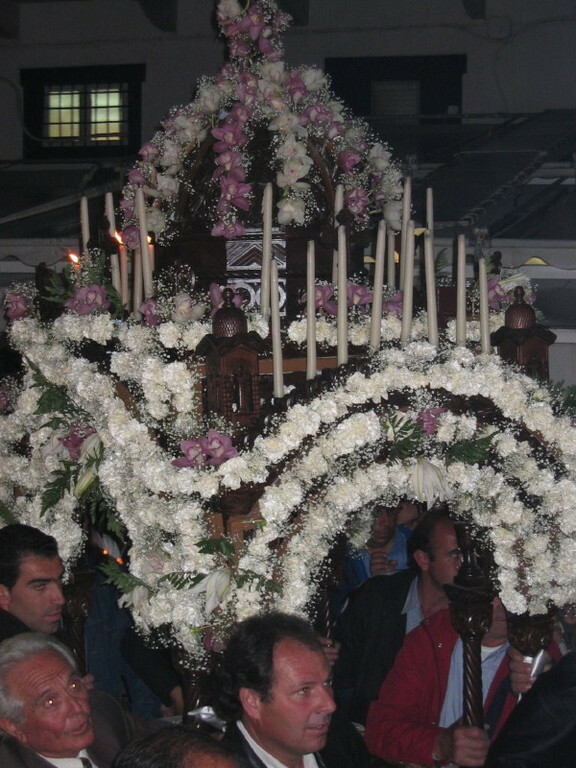 Traditionally the oldest man on the island uses what is reputed to be the oldest gun on the island to shoot the traitor, which theoretically should ignite the petrol douced effigy, signalling the start of the fireworks display. 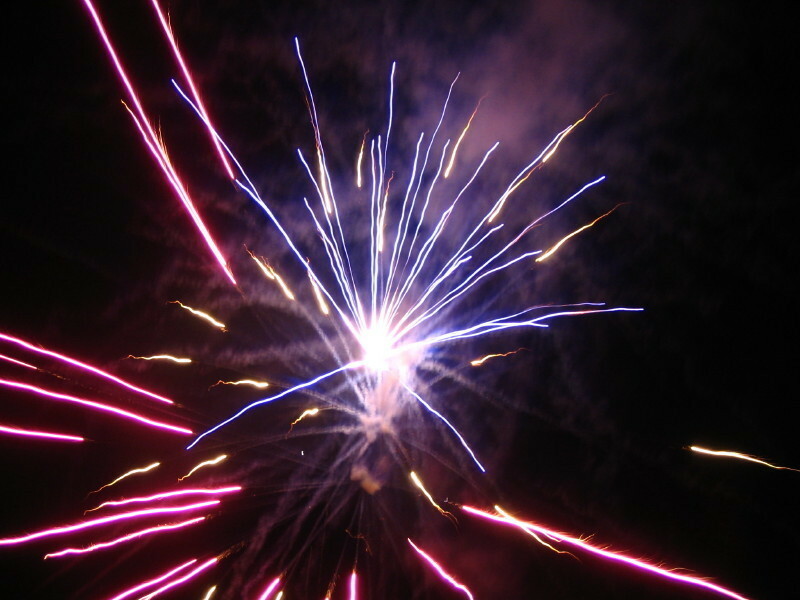 Invariably though, every man on the island with a gun takes a shot and after numerous false starts the Judas blaze finally gets going and only then do the fireworks start!